I grew up and went to school in New England (Massachusetts and Rhode Island) and then spent several years in the Middle East. As a US foreign service officer, I was director of the J. F. Kennedy Cultural Center & Library in Beirut from 1965–69, and from 1974–76 I taught in the MA in TEFL program at the American University in Cairo. 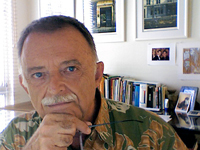 In 1976 I relocated to Hawai‘i, where I’ve lived ever since—except for a wonderful Fulbright assignment in Rio de Janeiro in 1983—teaching courses in the MA and PhD programs at the University of Hawai‘i at Mānoa until retiring in December 2011. I was also director of the National Foreign Language Resource Center (NFLRC) from 1995–2011, one of a network of centers across the US with a mandate to build national capacity to learn and teach foreign languages effectively. My primary research area is cognitive and affective factors in adult second and foreign language learning—including the role of attention and the importance of motivation in learning. Other areas include sociolinguistics (macro and micro) and the particular problems of learning and teaching difficult, less commonly taught languages. Richards, J. C., & Schmidt, R. (2010). Longman dictionary of language teaching and applied linguistics (4th ed.). London: Longman (Pearson Education). Schmidt, R. (2010). Attention, awareness, and individual differences in language learning. In W. M. Chan, S. Chi, K. N. Cin, J. Istanto, M. Nagami, J. W. Sew, T. Suthiwan, & I. Walker, Proceedings of CLaSIC 2010, Singapore, December 2-4 (pp. 721-737). Singapore: National University of Singapore, Centre for Language Studies. Schmidt, R. (2008). National language policy or a framework for a national language education policy? Modern Language Journal, 92, 621-623. Schmidt, R. (2001). Attention. In P. Robinson (Ed. ), Cognition and second language instruction (pp. 3-32). Cambridge University Press. Kassabgy, O., Boraie, D., & Schmidt, R. (2001). Values, rewards, and job satisfaction in ESL/EFL. In Z. Dörnyei and R. Schmidt (Eds. ), Motivation and Second Language Acquisition (pp. 213-237). Honolulu: University of Hawai’i, National Foreign Language Resource Center. Schmidt, R., & Watanabe, Y. (2001). Motivation, learning strategies, and pedagogical preferences. In Z. Dörnyei and R. Schmidt (Eds. ), Motivation and Second Language Acquisition (pp. 313-359). Honolulu: University of Hawai’i, National Foreign Language Resource Center. Ellis, N. C., & Schmidt, R. (1998). Rules or associations in the acquisition of morphology? The frequency by regularity interaction in human and PDP learning of morphosyntax. Language and Cognitive Processes, 13.2/3, 307-336. Ellis, N., & Schmidt, R. (1997). Morphology and longer distance dependencies: Laboratory research illuminating the A in SLA. Studies in Second Language Acquisition, 19, 145-171. Kasper, G., & Schmidt, R. (1996). Developmental issues in interlanguage pragmatics. Studies in Second Language Acquisition, 18, 149-169. Schmidt, R., Boraie, D., & Kassabgy, O. (1996). Foreign language motivation: Internal structure and external connections. In R. Oxford (Ed. ), Language learning motivation: Pathways to the new century (pp. 9-70). Honolulu, HI: University of Hawai`i, National Foreign Language Resource Center. Schmidt, R., Shimura, A., Wang, Z., & Jeong, H-S. (1996). Suggestions to buy: Television commercials from the U.S., Japan, China, and Korea. In S. M. Gass & J. Neu (Eds. ), Speech acts across cultures (pp. 285-316). The Hague: Mouton de Gruyter. Schmidt, R. (1995). Consciousness and foreign language learning: A tutorial on attention and awareness in learning. In R. Schmidt, Ed., Attention and awareness in foreign language learning (pp. 1-63). Honolulu, HI: University of Hawai`i, National Foreign Language Resource Center. Schmidt, R. (1994). Deconstructing consciousness in search of useful definitions for applied linguistics. In Hulstijn, J.H., & Schmidt, R. (Eds.) Consciousness and second language learning: Conceptual, methodological and practical issues in language learning and teaching, Thematic issue of AILA Review - Revue de l'AILA, 11, 11-26. Schmidt, R. (1994). Implicit learning and the cognitive unconscious: Of artificial grammars and SLA. In N. Ellis (Ed. ), Implicit and explicit learning of languages (pp. 165-209). London: Academic Press. Schmidt, R., & Savage, W. (1993). Challenge, skill and motivation. Pasaa, 22, 14-28. Schmidt, R. (1987). Sociolinguistic variation and language transfer in phonology. In G. Ioup & S. H. Weinberger (Eds. ), Interlanguage phonology (pp. 365-377). Rowley, MA: Newbury House Publishers. Schmidt, R. (1986). Applied sociolinguistics: The case of Arabic as a second language. Anthropological Linguistics, 28, 55-72. Schmidt, R., & Frota, S. (1986). Developing basic conversational ability in a second language: A case study of an adult learner of Portuguese. In R. R. Day (Ed. ), Talking to learn: Conversation in second language acquisition (pp. 237-326). Rowley, MA: Newbury House. Richards, J.C., & Schmidt, R. (Eds.) (1983). Language and communication. London: Longman (Applied Linguistics Series). Schmidt, R., & McCreary, C. (1977). Standard and super-standard English: Recognition and use of prescriptive rules by native and nonnative speakers. TESOL Quarterly, 11, 415-429.